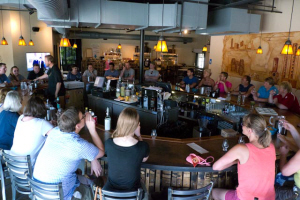 Great Lakes Distillery is a great place to hold your next event! We offer a variety of options that make us the perfect location for private, corporate, fundraising, and media events as well as social celebrations like birthday parties, reunions, college graduations, and even intimate wedding receptions. We have a tasting room bar featuring our hand-crafted award winning distilled spirits. Virtual Tour of our Space. Whether you host your event in our tasting room, the patio, or reserve the use of our entire venue we can cater to the needs of your event. In all, Great Lakes Distillery can accommodate up to 250 guests. Our tasting room is centered around a circular bar holding Great Lakes Distillery hand-crafted spirits. Perfect for social cocktail parties, corporate happy hours and fundraisers, the tasting room can accommodate up to 70-seated guests and up to 120 standing. It also includes a small shop featuring Rehorst spirits, glassware, souvenirs, and more. 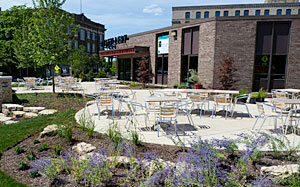 Great Lakes Distillery’s beautifully landscaped outdoor patio can accommodate approximately 65 guests. It offers beautiful views of the Downtown Milwaukee skyline and the scenic Walker's Point Neighborhood. Need more information or want to schedule your event? Please call our Event Coordinator at 414-431-8683 Ext. 111 or complete the form below. Interested in holding an event at the distillery? Please complete the form and we will respond to you asap! You may also call us at 414-431-8683 x111.